Bloomfield Guest House has a wonderful balance between the bustling town of Bloomfield and a quiet retreat atmosphere where you can enjoy the natural beauty that the County offers. Begin your mornings sipping fresh ground coffee on the brand new deck. 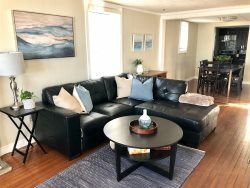 The Guest House is within walking distance to friendly Main Street Bloomfield with new restaurants like Flame & Smith and Bloomfield Public House and others such as; Agrarian Bistro, Saylor House Cafe, galleries, and unique shopping boutiques. House conveniences include a queen sized bed on the lower level and one upstairs. Bed and bath linens are supplied. A 6 person table and chairs and a BBQ on the deck in the back yard. Brand new washer and dryer are provided as well on the main floor. This home allows dogs upon confirmation by owner. Please ASK and let us know breed. A $50 fee per dog applies. The Bloomfield Guest House is welcoming and bright. Great location within walking distance to restaurants and shops in the quaint little town of Bloomfield. The house is super cute and quiet, on a main road but you wouldn't know it. Even sitting on the deck in the backyard - private oasis. Great spot for a quick getaway. We will be back for sure! The house is really nice and clean, in a nice little town near the Sandbanks. We have been there with our two sons (9+8Y) and we loved it! 1 night year round and 2 night holiday bookings may be possible at last minute (within 1-2 weeks of stay). Please ASK.